We are always working to improve our equipment. As such, we offer updates to bring your amp up to our most current design specification. The updated amplifier or preamp will meet or exceed the specifications for the Mk. 3.3 products that we build today. The 3.3 revision is audibly lower distortion- they are smoother, more open and transparent. Any product update to the current revision reactivates the warranty, which covers everything on the product except tubes. Upgrades and updates with warranty reactivation are available for legacy Atma-Sphere amps (M-50, Novacron) and preamps (MLS-1 and P-2) as well. We fully support all of our legacy products; many of the updates available for legacy units were developed long after the unit was discontinued. This is a three-piece system that replaces the single piece top cover on older preamps. Once installed the Side Panels are not removed. The top cover is then secured by six screws instead of eighteen! This makes the preamp easier to deal with if you are replacing tubes, it looks better and the heavier side panels provide better chassis damping. 320 for MP-3, 640 for a set for the MP-1. MA-2¹ 7,600 The MA-2 Mk 3.3 has an improved power supply and power supply enclosure. MA-1 1,975 - 4,925 Includes addition of V-Cap Teflon coupling capacitors. MA-2¹ 8,400 - 9,800 Includes addition of V-Cap Teflon coupling capacitors. MP-1 7,980 See right column for more information on preamp updates. MP-3 3,400 The preamp is rebuilt with a new circuit board. MP-1 8,100 See right column for more information on preamp updates. The Mk3.3 level has affected the MP-1 more than our other products, requiring a new circuit board for its execution. The Gain Trim controls got redesigned to improve performance and reduce noise. They now have a much wider range. This allows you to set the gain structure the way you need it (easier to use with digital sources) and is also more transparent. The phono section has significantly more gain and lower noise. The line stage has been improved with reduced distortion and wider bandwidth. To update the MP-1, the circuit boards in the preamp section are replaced. The volume control is retained from MK3.1 and Mk3.2 models. This results in the Mk3.1 and Mk3.2 being less expensive to update. Older preamps require the power supply be rebuilt as well. Our regulator system is also available as an upgrade for the MP-3 or older MP-1s for 700 as a replacement for the 6080 regulator tube. This update should only be considered if for whatever reason an update to Mk. 3.3 is not being done at this time. High voltage regulation - the tightest/lowest noise on the market. Prices do not include shipping or cost of repairs due to age, damage or tampering. The updated amplifier will meet the specs (except for power in rare cases) for the Mk. 3.3 amplifiers that we build today. In addition, a new warranty is applied to any and all equipment that we update to the current revision. ¹ Do not send MA-2s to us via UPS. Use a carrier with Fragile Handling service. ² These updates apply to all Atma-Sphere equipment built before November of 2004 (serial numbers 646 and earlier). Prices are maximums and may be less according to vintage of unit. Amplifiers built during 2004 are considerably less expensive then those built earlier. The first figure is for a late (2003-2004) model and the second is the maximum cost for an early model. What is Atma-Sphere Music Systems, Inc. all about? Atma-Sphere was founded in 1978 and is the oldest manufacturer consistently producing OTL (Output TransformerLess) and triode amplifiers. 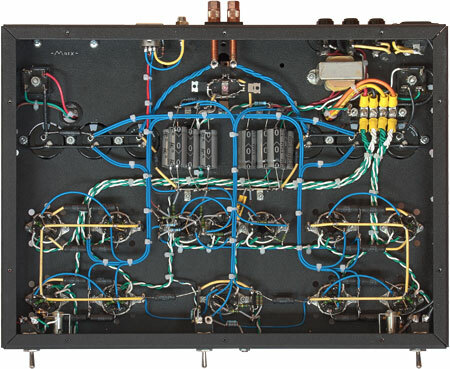 Ralph Karsten designed and patented the music producing circuit which makes our products the best in the world. How does Atma-Sphere's patented design work? In each audio channel, there are two single-ended triode amps running 180 degrees out-of-phase with each other (differentially). So distortion is cancelled at every point throughout the amp (without feedback), leaving only the music. Thus, Atma-Sphere combines the power of push-pull with the musicality of single-ended, but with better sound than either, because the output is direct coupled (no output transformer). Thus, our gear is wide bandwidth, very dynamic, extremely neutral, and virtually distortion-free. Will the new amp/preamp work with my current preamp/amp? Yes. Atma-Sphere equipment can be run either Balanced or Single-Ended. There is no need to modify your system to use our preamps or power amps. In fact, most of the reveiws on the power amplifiers were written with single-ended preamps. Alternately, we can add balanced inputs to your amplifier regardless of manufacturer. The balanced input is a simple, transformerless modification that does not change the character of the amplifier. Even on single-ended amplifiers, the input will be a true differential input. Contact us for details. Are your amplifiers really class A? Yes. Our amplifiers are set up to run what is known as class A2. To accomplish class A2 the bias point has to be shifted slightly (relative to the classic A1 point found in many textbooks) and that point must be chosen carefully to avoid cutoff during the waveform cycle. This approach trades some linearity for increased power output in a way similar to but not as profound as classes AB1 and AB2. The power tubes conduct throughout the entire waveform all the way to full power, but during part of the cycle also have significant grid current. This requires a driver circuit that can handle the grid current without loss of linearity- we feature a simple and reliable circuit that does just that in all of our amps. OTLs have requirements having nothing to do with class of operation that make this kind of approach quite important for stable and reliable operation! In addition this allows for instantaneous overload recovery, a vital feature in a high quality amplifier. Class A1 circuits do not have grid current and operate at a different point on their load lines. The class of operation in any tube the amp is also dependant on the load being driven; if the load (speaker) impedance is too low the amplifier operates class AB2. In the case of the M-60, it is class A2 into 8 ohms but class AB2 into 4 ohms. This is a reason why it is a good idea to keep the speaker impedance higher if you can, although it is not by any means the most pressing- for reasons other than class of operation the amplifier will be lower distortion driving higher impedances (and the amplifier runs cooler into higher impedances too). We avoid marketing terms, using only engineering/technical terms in the description of class of operation. For example 'pure class A' is a marketing term, not an engineering term, as is 'real class A' (although by definition obviously our amplifiers are 'real' class A...) or 'enriched AB' (which is simply 'class AB'; 'enriched' or no has nothing to do with it). Sometimes it is helps to describe something by what it is not; since our power tubes do not go into cutoff, our amps are neither class AB1 or AB2 (within load limits as mentioned earlier). The only definition that fits is class A2. Can the equipment be built for 235 volt operation? Yes. Atma-Sphere products are silent with 50 Hz operation, making for especially quiet transformers. Please specify if you need overseas voltages. Will the preamp work with my low output cartridge? Yes. Any cartridge of .2 mV or more will work. An optional stepup transformer for ultra low output moving coil cartidges is available too. What is the break-in period for my new equipment? About 2-6 weeks depending on use. Though our stock equipment ships with quality components, we offer upgrades of certain components upon request. Some common upgrades include: Caddock resistor package (standard on MA-2 and MA-3), Teflon coupling caps, power supply capacitance boost (for M-60 and MA-1). A remote volume control is available for the MP-1. Other options are listed on individual products pages. Is the price stated for a single chassis or for a pair? Except for the S-30, Atma-Sphere power amps are monoblocks, which means there is a single channel per chassis. Therefore, all power amp pricing is for a pair of chassis. Do you make a phono stage? Yes. Both of our preamps are designed as stand-alone phono reproducers. Since we developed and patented our line stage technology, it happens to be a fact that they do sound better than any other line stage available at this writing. This has been true since the inception of the preamps in 1989. So if you want to hear the best that phono can offer, it is best done through our preamps. By incorporating the phono into the preamp, we eliminate the variables of interconnection between the phono section and the line stage and we offer one of the best volume controls available in the industry. Our patent allows for performance in the line stage that is obviously superior to any line stage available elsewhere even when price is no object. Are Atma-Sphere products Futterman OTLs? No. Our gear employs our patented Circlotronic® design which is not only much simpler, but side-steps the problems of the Futterman, making OTLs available to a much wider audience. Again, no. The Futterman and New York Audio Lab amplifiers (sold by Harvey Rosenburg) created this reputation. A properly designed OTL such as an Atma-Sphere OTL is very reliable and are proven to run for decades without service other than tubes. Is the amp stable? Under what conditions might it oscillate? Our amplifiers are unconditionally stable. They will not oscillate with any load or input condition. If a tube arcs will it damage my amplifier? No. The amplifier circuit is quite rugged. If a tube goes down will it damage my speaker? No. We have been building these amplifiers for over 3 decades; the amps are designed to prevent damage to speakers through several techniques which are quite effective. In that entire time we know of no legitimate case of speaker damage caused by our amps. Does the amp produce a lot of heat? All Atma-Sphere amplifiers operate Class "A". They run about 10% hotter than an transistor amp with equivalent power operating in Class A. To give you a better idea of this, if the amplifier is left on Standby for a day, the heat is makes is negligable. At the end of the day you could still touch the envelopes of the tubes without concern. The heat is caused by the class of operation, not the number of tubes! Will the amp be comfortable with my loudspeaker? We recommend you read our paper on the Voltage and Power Paradigms! There is more to it than simple impedance, but as with all tube amps, 8 ohms or more is preferred for best results. The MA-1 and MA-2 are quite comfortable on 4 ohm speakers. For lower impedances that don't need a lot of power, there is an outboard device called the ZERO that is surprisingly effective, in fact so much so that for 4 ohm speakers, Atma-Sphere and a set of ZEROs are often one of the best choices available. What is the function of the meter? On our older amps: The bias is set using the meter and the appropriate controls located on each chassis. The procedure (outlined in the owner's manual), is simple and requires less than one minute per chassis to complete. On the new Mk. IIIs and Mk. 3.1s: the meter allows you to monitor output power and is also used to set DC Offset. The bias is automatic on the Mk. III/Mk. 3.1 amplifiers. Do I need to know a lot about the tubes? No. Atma-Sphere equipment is designed to work with commonly available tubes, making our products easy to live with. The 6SN7 tubes we use are produced in China but there are many aftermarket versions available. The output tubes are Sovtek, Svetlana or Chinese. The miniature triodes used in the preamps such as the 12AT7 and the 12AU7 are usually Chinese. Other types of tubes may be available on request. ¹ Tube complement shown for stereo operation; for single-channel ouput the amp requires only 5 tubes. ² All values are for Mk. III and higher amplifiers. If you are running the amp single-ended, make sure there is a jumper betwen pin 1 and pin 3 of the XLR input. If the buzz exists on only one channel, try swapping the interconnect cables to be sure that the buzz is not at the source. We have seen on-going problems with 6SN7s marked as "Sovtek" and "Electro Harmonics" More recently we have seen similar problems in reissue tubes marked "Tung Sol" and "Mullard". We do not recommend these tubes in our products. While they will not damage our products, neither will they perform optimally or reliably. If you are experiencing a problem and any of these tubes are installed, replace them first before doing anything else. 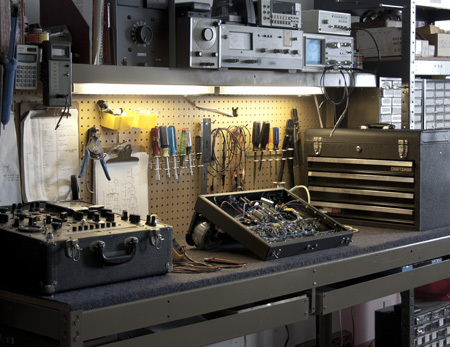 Our shop doesn't just build amps; we also use our expertise to test, update, and repair equipment as well. Our equipment has a reputation for a lifetime of use before service is needed. We stand behind our older products; our amps from decades ago still sound better than most amps made today. However, you may find that a minor checkup can breathe new life into an amp you have had for many years, or even one you just bought secondhand. We happily check out equipment bought used on Audiogon, eBay, or any other third party vendor. If there is any doubt as to the legitamacy and condition of the equipment, we can help you assess it's performance and value. This would also be a good time to think about updating your equipment to the latest revision; this has the added benefit of reinstating the warranty. We also supply replacement parts, new tubes, and shipping containers for our equipment. Our shop is also equipped to service tube equipment of all sorts. Just call ahead so we can be ready for it. Contact us at (651) 690-2246 or ralph@atma-sphere.com.